Message Theosophique et Social, Le. 1/1, 1919-1924. 8 pp., 10 francs a year. This was a short-lived attempt of the French section of the Theosophical Society to recover its political and artistic influence after the secession of Gaston Revel and his journal L'Affranchi, the organ of the Centre Apostolique/Les Veilleurs. 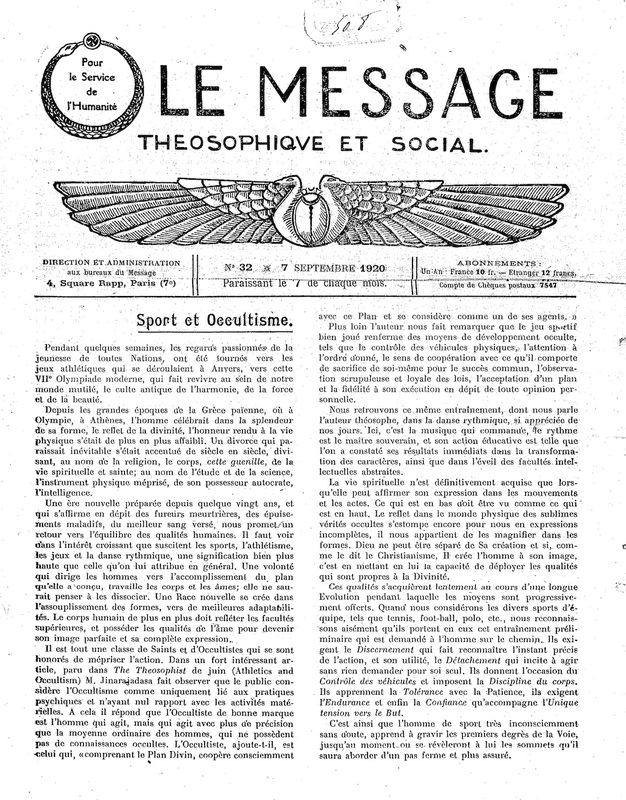 It was published from the headquarters of the Theosophical Society on Square Rapp in Paris but limited its contents to what it viewed as the "social" message of Theosophy, carrying articles on the reform of secondary education, the Indian Problem, feminism, art for the people, etc. It replaced Kouroushetra, named after the battlefield in the Bhagavad Gita, which was directed to the "working classes." See the notes under Le Theosophe and L'Affranchi. Massimo Marra notes that this "was evidently the reaction to the secession of the Veilleurs and, at the same time, an attempt to recovery the original political project with stronger theosophical control and without any other external ideological influence. Without the enthusiastic contribution of the intellectuals and artists of the Centre Apostolique the attempt was unsuccessful, and without any practical achievement." BNF.